A stranger way to spend a Saturday evening. Zoe and Ana have a new obsession. It's called Small Potatoes and it's a new "short" on Disney Junior. They don't really ever see it on TV since it's on while they're at school. Since they don't get to watch it on TV... they watch it online. Over and over and over. 25 episodes. All about 3 minutes long. Including the opening song. It's actually a pretty cute little musical show with English children's voices. But when you need to listen to the opening Small Potatoes theme song every single episode... it gets a little old. 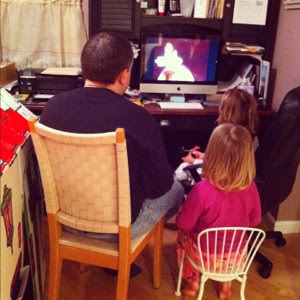 Let me just say... Nick was thrilled beyond belief to sit and watch a few episodes with the girls before bedtime. And now I know you'll be thrilled too since I found an episode on YouTube!